China Warns U.S. Over Surveillance Flights : The Two-Way Beijing rejected U.S. claims that one of its warplanes made a reckless intercept of a U.S. Navy P-8 and said if Washington wants good relations with China, it should end "close surveillance" flights. This handout photo provided by the Office of the Defense Secretary (OSD), taken Aug. 19, 2014, shows a Chinese fighter jet that the White House said Friday conducted a "dangerous intercept" of a U.S. Navy surveillance and reconnaissance aircraft. 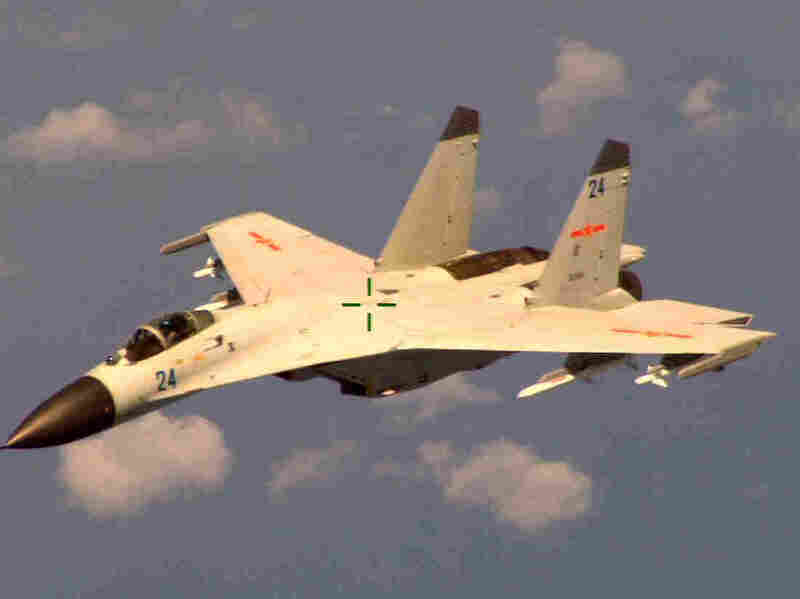 Beijing has rejected U.S. claims that one of its fighter jets acted recklessly in intercepting a U.S. Navy maritime patrol plane in the South China Sea last week, warning Washington to curtail or discontinue "close surveillance" flights near Chinese territory. "According to different situations we will adopt different measures to make sure we safeguard our air and sea security of the country," Defense Ministry spokesman Yang Yujun said at a news briefing. "If the United States really hopes to avoid impacting bilateral relations, the best course of action is to reduce or halt close surveillance of China," Yang said. As we reported last week, the Pentagon says a Chinese Su-27 made "aggressive and unprofessional" approaches of the U.S. P-8 Poseidon in international waters about 135 miles east of Hainan island. The Pentagon said the Chinese warplane made several passes under and alongside the P-8, coming within 30 feet or so. "China has long complained about U.S. surveillance flights that just skim the edge of China's territorial airspace. However, Yang said such flights this year have become more frequent, are covering a wider area and are coming even closer to the Chinese coast. "U.S. sea and air surveillance missions occur most frequently during Chinese military exercises or weapons tests, raising the risk of accidents and misunderstandings, Yang said. "That was a likely reference to an incident last December in which China accused a U.S. Navy cruiser, the USS Cowpens, of having veered too close to China's sole aircraft carrier in the South China Sea during sea drills. That nearly led to a collision with a Chinese navy ship in the most serious sea confrontation between the two nations in years."